The Legend Of Tarzan has too many subplots, and most of them are boring, warns Namrata Thakker. 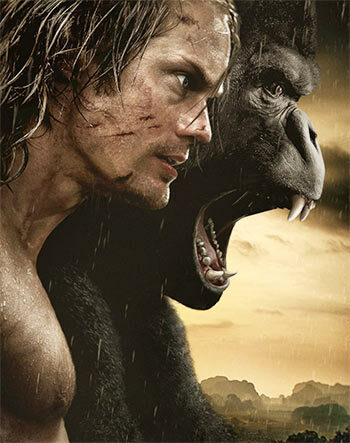 The story of ape man Tarzan is something most of us not only remember but cherish as well. As a kid, I loved watching Disney's animated version of Tarzan, which released in 1999. Naturally, I was super excited about watching another version of the same epic story. And this time, it was live action, in 3D! But The Legend of Tarzan didn't quite live up to my expectations. The film has too many things going on at the same time and in the end, it was far from being a worthy roller-coaster adventure ride. Though I got to see the apes, the jungles and Tarzan's infamous vine swinging, it just wasn't enough. And it just wasn't the same. Directed by David Yates, The Legend Of Tarzan stars Alexander Skarsgard as Tarzan/John Clayton and Margot Robbie as his wife, Jane Porter. Through flashback, we learn John's backstory and how as a orphaned kid, he was raised by African apes. But the movie is set in 1890, John and his wife Jane now live in England and haven't been to Africa for a decade. However, things change and John goes back to being Tarzan when George Washington Williams (Samuel L Jackson) enters the picture. An African-American veteran of America's civil war, Williams is sent to Congo to investigate slave trading. On the other hand, Leon Rom (Christopher Waltz) is a corrupt Belgian captain, who wants to own a diamond mine and rule Congo. The only man standing between him and his dream is Chief Mbonga (Djimon Hounsou). He is the head of the African tribe and his forces protect the land. If Leon Rom wants to have the diamonds, he must get Tarzan back home in exchange so that Chief Mbonga can kill him. John is invited to the Congo as a British trade delegate. Unaware of Rom's scheming, Williams also convinces John to come along with him to Congo. The drama starts here -- how John goes back to being Tarzan, how he tries to help the African natives and how he rescues Jane who gets kidnapped in-between. As if all this isn't boring enough, the makers also show Tarzan and Jane's love story in flashback. The makers have focused on everything else but Tarzan and his jungle adventure. Christopher Waltz stands out without a doubt. He plays his villainous character superbly. He commands attention every time he is onscreen. Alexander Skarsgard looks good and his toned body is, of course, a treat to the eyes. But as Tarzan, he isn't fully convincing. Maybe that's one reason why you see him more in action rather than talking. It would have been interesting if the makers had showed why John left his wild ways behind and why he tries to escape from his jungle life. Samuel L Jackson and Margot Robbie are average. You'll forget their performances once you walk out of the theatre. The VFX is a letdown as well. If you have got absolutely nothing to do this weekend, you can kill time watching The Legend of Tarzan. But then, there are always better things to do.